But this isn’t a post about that “present.” It’s a post about my favorite present of the year. And to get into that, I need to give some context. Denisa and I have been working on getting our kids to understand what money really means. We’ve been doing goals all along (I’ve posted about that before), but the money that they’ve “earned” that way has always just gone directly into a fund I’ve set up kind of arbitrarily. They never saw the cash. They just saw an abstract number increase. And while following those abstract numbers works just fine for me, it was clear it wasn’t making any impact with the kids. So we’ve switched over to a weekly allowance, still tied to goals and chores. And we had a big powwow with the kids to talk about how much of their allowance should go into savings. In the end, 10% goes to tithing right off the bat, and then they’re socking away 40% of it to savings, which means they get half of their allowance in cash up front. They can use that cash for whatever they want (within reason). I try to steer them away from any really egregiously silly purchases, but in the end, it’s their call. So already we’ve had children who understand that things cost money, and they’re making the connection between working, money, and saving up for things you want. TRC in particular has started making connections. He has a ton of wants–he’d love a Minecraft costume, Minecraft Lego set, his ski pass, and the new Pokemon game coming out in October. The problem? All of those together cost about $150 total. He had around $45, after he’d paid for the ride bracelet. The ski pass won’t need to be paid for until January or so, and that means he’ll have around $70 by then, if he saves his allowance every week. So he’s working extra around the house, and he’s constantly debating what thing he wants the most. For a while, he was convinced it was the Lego set. Then I asked him how many hours he thought he’d play with it. He guessed around 4. I asked him how many hours he’d play with a new Pokemon game. He guess around 100. They cost about the same. He concluded the Pokemon game might be the wiser choice, bang for buck-wise. In any case, this is just to say that he’s beginning to understand money. And it was my birthday, and he has his own money, and he really wanted to pay for a present for me on his own. Denisa took him to the store, and he spent a long time trying to find the perfect present for me. In the end, he settled on a $10 Clone Tropper. Denisa had some other suggestions–he could go in on some of the present she bought me. He could get something less expensive. 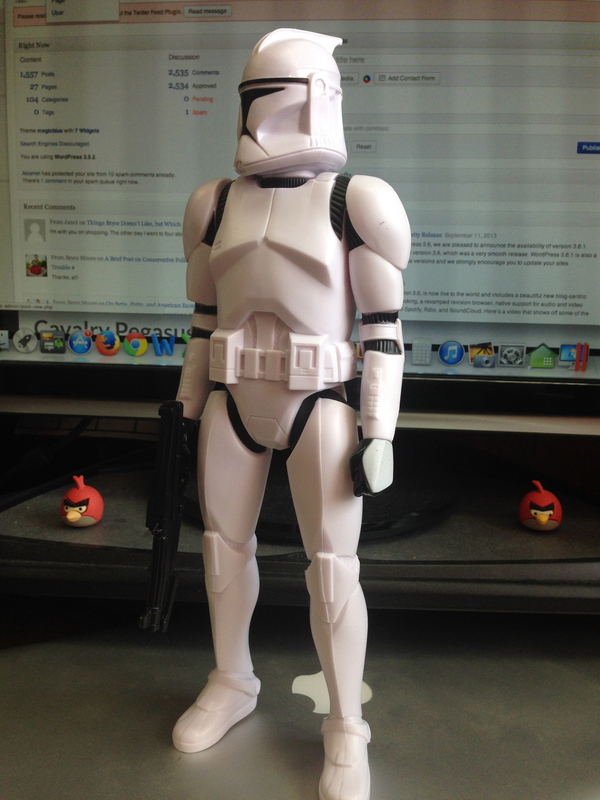 But he had decided on the Clone Trooper. $10 for TRC is about 20% of his disposable income at the moment. He bought it, brought it home, wrapped it, and presented it to me triumphantly at our family party. For all the ways I’m not a perfect father, it’s times like that when I feel like I must be doing *something* right. Thanks for the birthday present, TRC. This is great Bryce. Our only rule for how our kids spend the money they earn from us is that they can’t spend it on themselves. This makes for AWESOME gifts and builds bonds between one another. To see them actually want to sacrifice something they value to make someone else happy is a very rewarding feeling as a parent. I echo your thoughts precisely!